Englewood, a picturesque community shared by both Sarasota and Charlotte counties, is home to beautiful beaches, several hidden islands, nature parks, cultural events and more. Englewood has multiple public and private elementary schools, middle schools and is home to Lemon Bay High School. Manasota Key, one of Englewood’s barrier islands, is a peaceful 7-mile stretch of the most pristine and natural beaches in the area, including Englewood Beach, Manasota Beach, Stump Pass Beach and Blind Pass Beach. The winding drive through Manasota Key will lead you along a quaint path of 50’s-style beach homes and unspoiled mangroves – all leading to a breathtaking view of the Gulf of Mexico. 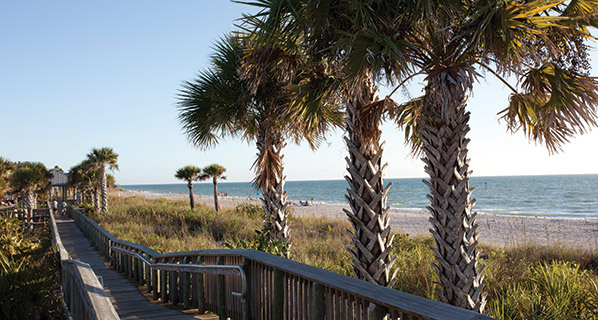 The area’s most recognized beach is Englewood Beach. Featuring a boardwalk, picnic tables, playground, BBQ grills, restrooms and changing facilities. There’s not much more needed to enjoy days, weeks, or even years, gazing into the ocean as the sun sets. Restaurants, tourist shops and local shopping can also be found nearby. Stump Pass Beach, located just a couple of miles south, is part of Florida’s state park system. Only a mile long, the beach and scenic trails leave a lasting impression. North of Englewood Beach is Blind Pass Beach, also known as Middle Beach. This beach includes nature trails with mangroves and sand dunes, shark’s teeth and more. The northern-most beach is Sarasota County’s Manasota Beach, popular for its tranquil environment. It is the only public beach in Englewood with a lifeguard and has a no smoking policy. Whichever beach is visited, is sure to be a relaxing and memorable experience. Numerous parks can be found in the Englewood area. Ann Dever Memorial Regional Park, Lemon Bay Park and Nature Center, and Cedar Point Environmental Park highlight a few of the most recognized of the community. Many of the parks offer canoeing, kayaking, fishing, nature preserves, environmental centers and more. Needless to say, there’s always something to do in this unique waterfront community. Where few buildings reach a maximum of three or four stories, serene, undisturbed atmosphere is sure to create lasting memories.